Twilight Haven operates as a non-profit corporation. We have a unique offering of affordable independent senior apartments, assisted living apartments as well as skilled nursing services within our 10 acre campus. We have nurtured a culture of a professionally trained, experienced staff who delivers outstanding care to each of our residents. Our wellness philosophy involves encouraging residents to actively engage in programs that promote their independence. 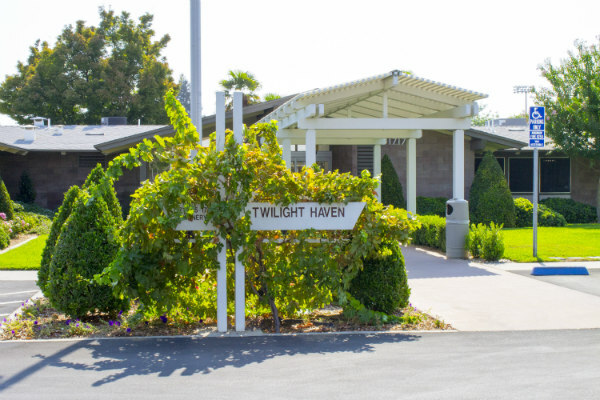 Twilight Haven is a non-profit California Corporation, whose purpose and programs are designed and staffed to deliver maximum service at the lowest possible rate structure necessary to maintain a pleasant, friendly atmosphere for persons sixty or older. Check back periodically for updates ! My Mother has been a resident for over two years now. The staff is compassionate and caring. They often go out of their way to assist the residents and their families. The home is always neat and clean. The residents have a variety of activities to participate in. My Mom is happy there, and has many wonderful people supporting her. I’m very happy here. It’s peaceful and safe. They are just very friendly at Twilight Haven – extremely helpful with the information they gave – and have bent over backwards to accommodate any requests we had for our parents. The best place to work. I love my residents and my co-workers. Keep up the amazing team effort Twilight! I had several friends that had grandparents and parents at Twilight Haven, so I am fond of them through word of mouth. I like the facility’s affordability. Their staff is excellent too. We want to thank all of the Twilight Staff for taking very good care of our mother. I know that on many days your staff has went beyond their job duties to assist and care for her needs. I am also very thankful for the wonderful care your staff gave my father during his battle with Alzheimer’s Disease. I cannot express the kindness and compassion shown by all of the Staff members at all times. Everyone showed a loving and caring attitude. Without exception, my aunt has been treated with the most amazing understanding. She struggled all of her life and now, in the “twilight” of her years, she is in the hands of many angels. We are accepting new tenants. Know Someone that would fit well here? We offer referral bonuses for tenants that refer someone to our community. Send us an email @ info@twilighthaven.com or fill out the following contact form.